This modern tube beast delivers awesome, old-school sound. 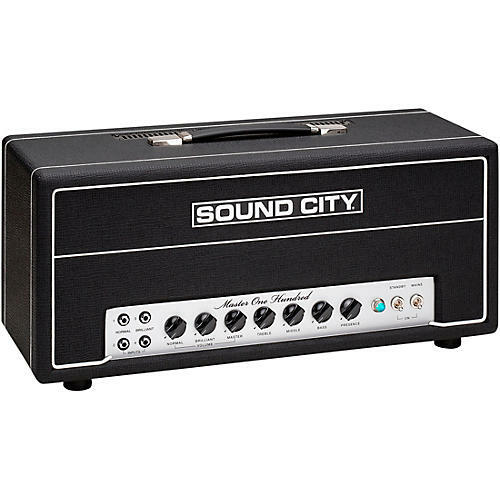 Meet the Sound City Master One Hundred amplifier, a 100 watt beast with a massive sonic footprint at any volume! The One Hundred’s dynamic range delivers a "whomp" and "snap" that will breathe new life into your playing style. From the first note, the inspiring tone will bring you back to the nuanced and muscular vintage sounds of countless classic recordings, without the need to run the amp at insanely high volume levels. These amps are musical tools of deep expression, bringing the best out of the player and their instrument. The One Hundred also excels as a power house foundation for your pedals and effects. Whether straight-in or with your pedal board, the Sound City Master One Hundred is the ultimate sonic platform.